Looking for hotels near Finikoudes Beach? Located in Larnaca, P.L Hermes Studios & Apartments offers accommodations with free WiFi and flat-screen TV, as well as a terrace. Some units also have a kitchen equipped with a microwave. Featuring air conditioning, Panagiotis Apartment offers accommodations in Larnaca. Europe's Square is 656 feet from the property. Free WiFi is featured throughout the property. Located 328 feet from the heart of Larnaka, right on Finikoudes Beach and promenade, this 4th floor apartment features views of the sea. Free high-speed WiFi is provided. Located right on Finikoudes beach, featuring sea views and 328 feet from the city center, the modernly decorated, 2-bedroom Lazuli Beach Apartment No. 21 features free WiFi. Located 656 feet from Finikoudes Promenade in the center of Larnaca, Qbic City Hotel features a restaurant and free WiFi throughout the property. Foinikoudes beach can be reached in 3-minutes on foot.... I love the comfort of the room and the luxury! Spacious and it's close to bars and restaurants! Located right on the famous Blue Flag Makenzie Beach in Larnaca, the family-run Island Boutique Hotel features a restaurant and snack bar. Everything! Perfect hotel for a stay in Larnaca. Located in Larnaka, 656 feet from Agios Lazaros Byzantine Museum, Rimon Cyprus offers Kosher hospitality. Very much enjoyed our stay. Plan on coming back very soon! Achilleos City Hotel is in the center of Larnaca city, just 165 ft from Phinikoudes Beach. It offers air-conditioned accommodations with free Wi-Fi access. Good beds. Great breakfast and location. Friendly helpful staff. Quiet and peacful. Offering an outdoor pool, as well as a bar, Saint Elena Boutique Hotel is located in Larnaca Town. It features air-conditioned accommodations with free WiFi access. Foinikoudes Beach is 0.8 mi away. I enjoy being away from the bustle of the general tourists. Sveltos Hotel is located in Larnaca, 656 feet from the beach, and features a pool with a furnished sun terrace. Wawww!!! Amazing staff!!! Perfect breakfast!! Set in a charming 19th-century building, just 328 feet from the center of Larnaca, the Alkisti features an intimate walled-in garden. Perfect location right on the square but it manages to avoid all the noise. Hotels with great access to Finikoudes Beach! 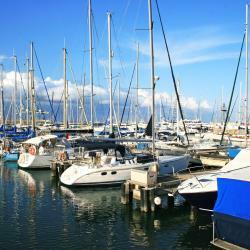 Mariandy Hotel is located on the seaside of Larnaka city. It features an outdoor swimming pool. Each accommodations has a balcony that overlooks the Mediterranean Sea. Free WiFi is provided... The service was excellent.The staff was very friendly,competent and professional. Located 1640 feet from the center of Larnaca, Elysso Hotel offers rooms, some with balcony. It has a rooftop swimming pool boasting panoramic views of Larnaca. WiFi is offered throughout. The staff are friendly; the rooms are very clean. It is rather peaceful. It's a good value. Larco Hotel is located 656 feet from the nearest beach and just a 10-minute drive from Larnaca Airport. The coffee in the room , the quality of hair conditioner and the view from the balcoon. Only a 10-minute drive from Larnaca International Airport, Flamingo Beach Hotel is located across from the famous Blue Flag Makenzie Beach. Location plus next to everything . 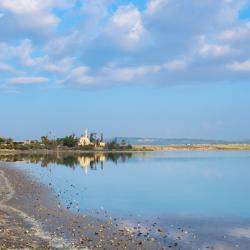 People are talking about Finikoudes Beach! Explore guest hotel reviews featuring "Finikoudes Beach"
The property is located in a quiet area, near the centre, very close to Saint Lazarus Church (3-4 minutes walk), bus stop nearby, maximum 10 minutes walk to Finikoudes bus stop, very close to the Finikoudes beach, shops and restaurants. The rooms are well equipped, clean and with comfortable beds. Konstantinos, is a friendly guy and a great host, willing to help. He has a lot of information about the city. I would recommend this location without hesitation! Very close to Finikoudes beach. Basically, you get on the beach in two minutes if you use the McDonald's shortcut ;-) The personnel was very helpful when we had some issues with bathroom cold water. Very tasty and various breakfast, greek music on the background. Modern and comfy mattresses. Close to the Larnaca intercity bus station (7 minutes). Great apartment, clean and comfortable. It was very cozy and the location is just perfect: right on the beach, at walk distance to Makenzie beach and Finikoudes beach and also close to the airport (which is very nice since you can see the airplanes landing in Larnaca). Nice and helpful hosts. Definitely one of the best in Larnaca! I had an amazing time in the hotel. The whole experience exceeded my expectations. The staff was super friendly, breakfast was excellent and the room very comfy. The neighbourhood was perfect, just few minutes walking from finikoudes beach. I will be definitely back. Thank you! Peaceful location, a twenty-minute walk to Finikoudes beach. Restaurants and two convenience stores are within walking distance. No. 425 airport bus stop is also nearby. Close to everything, a walking distance from finikoudes beach, the bus passes right in front of the hotel. Friendly staff. Very friendly staff, nice experience. Clean and comfortable location, 50 m (over the road) from the Finikoudes beach. Very good apartment with perfect equipment. Close to the center and Finikoudes Beach.